The wolves were all over the state this weekend, from Bunbury to Mullaloo, racing, supporting and enjoying the tail end of the season. 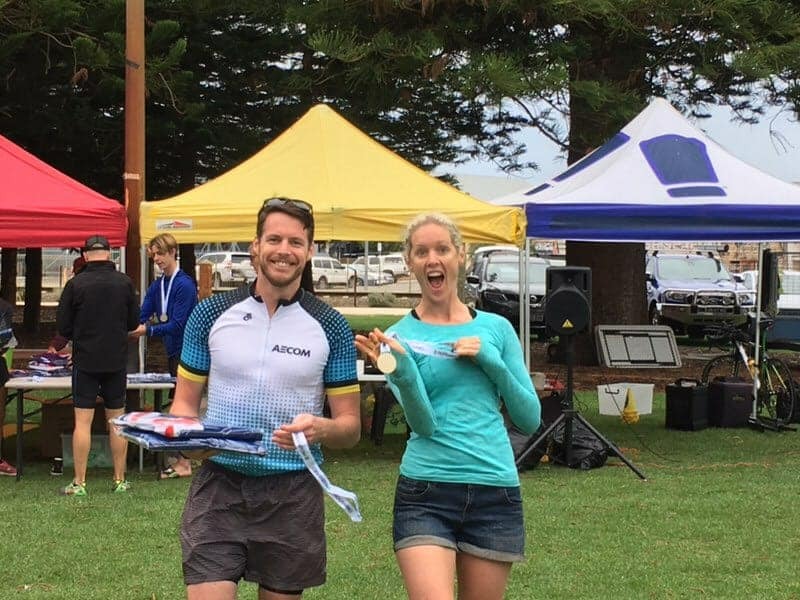 XTR’s Mullaloo triathlon was another fantastic event on the club race series with a choice of junior, sprint, olympic, duathlon and enticer events. Ten athletes made the trip north to gain some valuable club points to help secure the wolves in second place. Conditions on the day were fair. Although there were some gusty winds, the ocean was relatively calm but the bike leg had some challenging headwinds heading north. The wolves also had a good showing down south for the Bunbury City Classic and the State standard distance championship. Sadly another swim was cancelled, this time due to a freak swell which TWA and safety officials determined to be too dangerous to continue. Jenny was one of the few enticers to have gotten in to the water but it was rough going and a number of people had to be rescued. Certainly, it created a lot of debate amongst some seasoned open water swimmers who thought athletes should be given the right to choose. However many agreed it was a good call to prioritise safety in such conditions.Congratulations to everyone who raced and especially to Emma Moon who took out a prize for her age group. Big congratulations to newly-minted junior triathlete, Ally, on her maiden race. The smiles say it all! Freo was a small event with about half the field from Kolbe Catholic College and Scotch College. The corporate teams also made up a large number of competitors. The swim was at Bathers Beach in nicer conditions tan last year’s rain and choppy swell. The water was calm and very little swell. A long run to T1 made sense as the swim was only 400m for the sprint distance. The bike course started with a look around a roundabout before joining the main course and consisted of 6×3km laps. Tight twisty course down one end and a flat, fast section to the far turnaround. The run course across the train line was a 2 lap flat out and back with a slight headwind heading out which meant an easier run back to the start/finish. Congrats Floora and her corporate partner who won a gold in the duos.